At least 18 people have died after an express train derailed and flipped over on a popular coastal tourist route in Taiwan on Sunday, the island's worst rail accident for more than 25 years. Images from the site showed the Puyuma Express train completely derailed and lying zig-zagged across the track in northeastern Yilan county. All of the train's eight carriages had derailed and five had flipped onto their side near Xinma station, the railways administration said, adding that 366 people were on board the service en route to the southern city of Taitung. The emergency response centre said 168 people were injured in the accident, which happened at 4:50 pm local time (0850 GMT). "There are four carriages that were overturned at 90 degrees and the worst casualties were in those carriages," Jason Lu, head of the Taiwan Railways Administration told reporters. "The exact cause of the accident is pending investigation," he added. Taiwan's central emergency response centre had late Sunday revised down to 18 the previous official death toll of 22, without immediately clarifying why. Authorities have not confirmed if any passengers remain trapped alive inside the train. Bodies were seen being carried out of the wrecked carriages by rescue workers earlier Sunday evening. Cranes were brought in to lift the carriages from the tracks one by one overnight in a search for any remaining passengers. Chang Yi-long, 62, told AFP that he had "heard a loud bang" at the time of the accident while he was working at a construction site nearby. When he arrived at the scene he saw local residents helping passengers escape the wreckage. Video footage broadcast on local Taiwan television showed passengers smashing a window from inside and kicking it through to escape. "I smashed the safety glass and crawled out and I helped to pull a young man out. There was a person sitting behind me. I'm not sure she survived," a passenger told reporters. One passenger told Apple Daily Taiwan that the train had put on its "emergency brake" twice on the journey and that the electricity supply had been patchy. 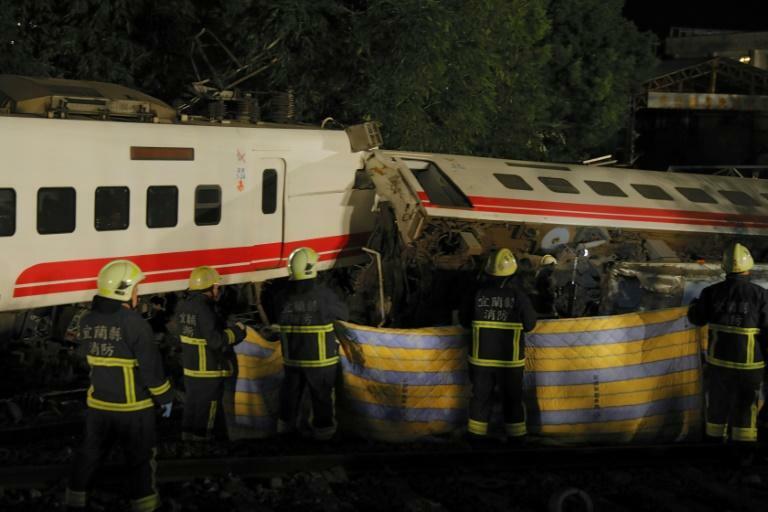 Hong Kong's broadcaster RTHK reported another passenger saying the train had been preparing to accelerate before overturning and had been shaking intensely, adding that some passengers were asleep at the time of the accident. The defence ministry said it had sent in 120 soldiers to help the rescue. 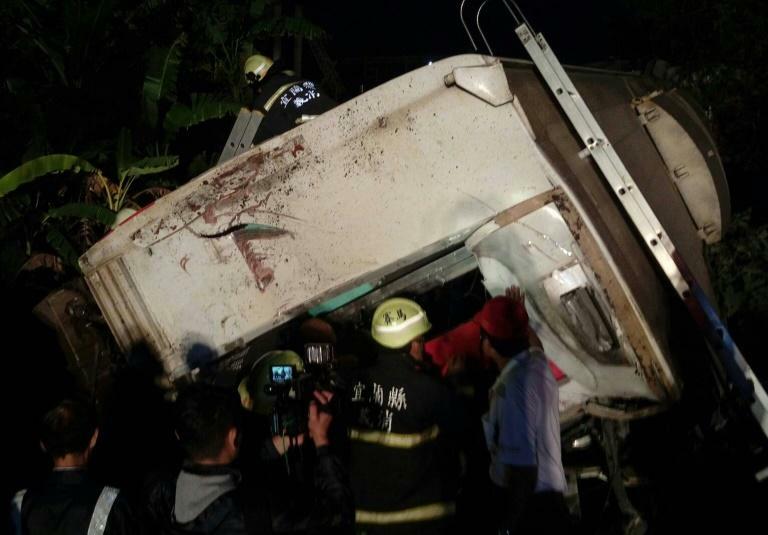 President Tsai Ing-wen described the accident as a "major tragedy" in a tweet Sunday evening. "My thoughts are with all the victims and their families," she added. The crash was the worst rail accident in Taiwan since 1991, when 30 passengers were killed and 112 injured after two trains collided in Miaoli. Thirty were also killed in 1981 after a truck collided with a passenger train at a level crossing and sent coaches over a bridge in Hsinchu. The worst crash in recent years was in 2003 when 17 died and 156 were injured after a train on the Alishan mountain railway plunged into a chasm at the side of the track.